ABOVE: The Copenhagen Admiral Hotel. INSET BELOW: Outdoors at the Hotel Twentyseven. A renovated 18th Century brick granary in Nyhavn houses a modern, comfortable hotel that overlooks the water and is just a short walk from both the Str�get pedestrian zone and Amalienborg Palace. You can also reach the Langelinie cruise terminal on foot if you don't mind a long walk with a roller bag. This Best Western affiliate has no-smoking rooms and allows pets. It's located in the city center, about 400 meters from Kongens Nytorv. The centrally located Hotel Vesterbro was Copenhagen's first all-new hotel building in 15 years when it opened in 1999. The 403 rooms have Spanish cherry furniture on parquet floors. Half are set aside for non-smokers, and five rooms are equipped for disabled guests. The Imperial Hotel is a member of the Golden Tulip group. It's near the Vesterport S-train station, about 300 meters from the main railway station and Tivoli Gardens. With a location near R�dhuspladsen (Copenhagen's main square) and Str�get (Europe's longest pedestrian street), this four-star deluxe hotel is convenient to sightseeing and shopping. It has an English theme, and its bar--the John Bull Pub--caters to both foreign visitors and Danish Anglophiles. Celebrity guests have ranged from Desmond Tutu to Boy George.. This 300-year-old building has been a mansion, a 19th Century luxury hotel, the Allied military headquarters after World War II, and the offices of the Danish Communist Party. 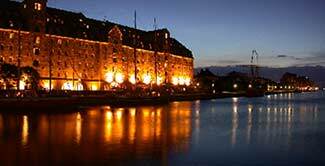 In 1991, it reopened as a hotel in Copenhagen's financial district. Top photo copyright © Copenhagen Admiral Hotel. Inset photo copyright © Hotel Twentyseven.